Scenic surroundings around Lake Grapevine are great for exploring by horseback. Marshall Creek Ranch sits close to Southlake homes and provides the perfect opportunity for city slickers to get back to nature. Trail rides meander through wooded areas, babbling brooks and subtle shores. With almost 40 acres of rustic terrain a quiet ambiance sets the scene for unwinding and just going with the flow. Once in the saddle, riders feel stress quickly melt away and become replaced by inner peace and invigoration. 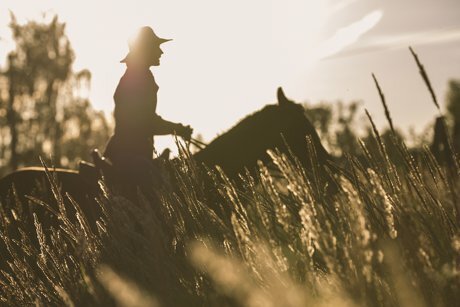 Marshall Creek Ranch wranglers are friendly and ready to pair eager riders with friendly steeds. Individuals are matched with animals depending on riding ability and confidence level. Four levels of riding skills are categorized at the ranch and range from beginner to advanced. Parties ride the trails to the skill level of the least experienced rider in the pack. Single riders often book on their own meeting new friends. Young cowpokes living in Southlake homes can take advantage of summer horseback riding camp. Greenhorns between the ages of 7 to 15 are welcome to saddle up and settle down. Anytime is a fine time to enjoy a trail ride on the Southlake property. Early morning and early evening trail rides beat the summertime heat. In fall and winter seasons the brisk feel of cool breezes bring color to the cheeks. In the thick of North Texas wilderness wildlife is all about. Favorite critters often spotted on rides include white tailed deer, coyotes, great blue herons, and red-headed turkey vultures. Saddle up for fun. Escape for an hour or two and enjoy the lush beauty of the local landscape with a trail ride. Reservations are required and can be made by calling 817.490.8796. Located at 4401 TW King Road, the ranch asks riders to arrive at least 15 minutes prior to their scheduled time. Closed toed shoes and long pants are a must. Be prepared to blaze a trail!